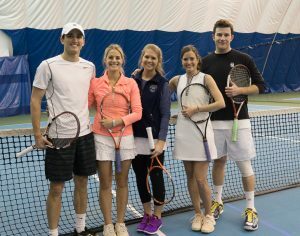 NYJTL Next is a group of young professionals (21-39) who are passionate about New York Junior Tennis & Learning and its programs. Members provide an important support network and serve a vital role in the success of NYJTL through fundraising and volunteering. Join a network of over 200 like-minded tennis and education enthusiasts from industries across New York City and make a new friend, doubles partner, and more! Friday, May 17 – NYJTL Next x Roosevelt Island: The only thing better than a casual round robin tournament is one that also supports NYC youth! Join us at the Roosevelt Island Racquet Club on May 17 from 7:30 – 10:30 for beer, wine, snacks, and a fun round robin tournament! Register here. Keep checking back for more opportunities to get involved! Questions? Contact Genesis Mullis at 347.417.8100 x 8205, or by email.